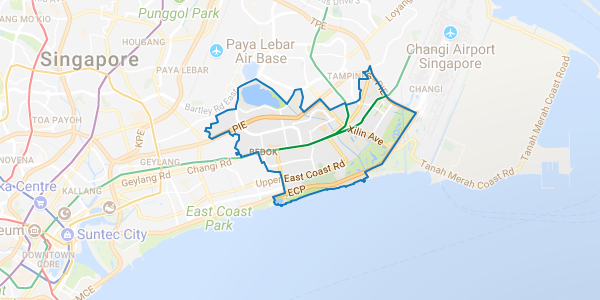 District 16 comprises Bedok and Upper East Coast Road. Properties in this district contain a mixture of public and private housing estates with industrial areas. This district is served by the Bedok, Tanah Merah and Kembangan MRT stations on the East-West Line. There are also two upcoming MRT stations, namely, Bedok North and Bedok Reservoir of the Downtown Line, which are expected to open in 2017. Bedok can be subdivided into mainly Kaki Bukit, Bedok Reservoir, Kembangan, Bedok North, Frankel, Bedok South, Siglap and Bayshore. Apart from being a HDB estate, landed homes and condominiums are also aplenty in Siglap, Frankel and Kembangan. Shopping malls in district 16 include Bedok Mall, Siglap Shopping Centre and Siglap Centre. Feng Shan Primary School, Tao Nan School and Bedok Green Primary School are some of the schools in the district. A host of new developments has turned the district into a hot spot for buyers, as developers targeting sites surrounding the Tanah Merah MRT station. Popular projects in the district include Costa Del Sol, The Bayshore and Bayshore Park.